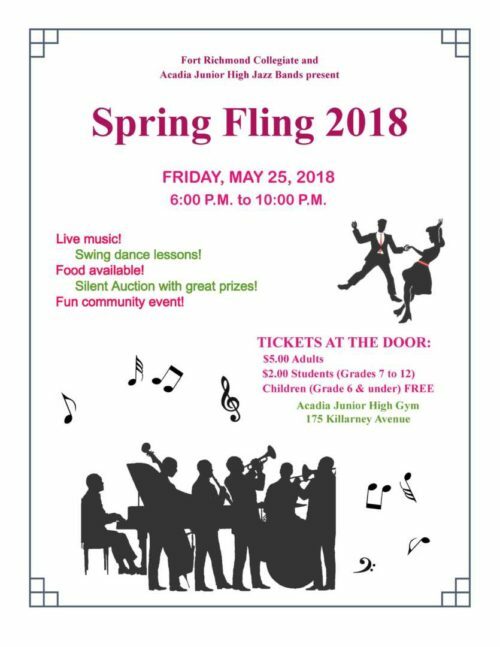 The annual Fort Richmond Collegiate and Acadia Junior High Spring Fling is just around the corner! This annual fundraising event in support of the band programs at both schools has become a favourite in the community. Please join in the fun and take part in this great community event, featuring live music from the award-winning Jazz Bands of Acadia Jr. High and Fort Richmond Collegiate! There will be dancing, a silent auction, hot dogs and hamburgers, and other concession-stand favourites. See you there!